My friend Susan lent me a copy of a Southern Living publication called Backyard Retreats. The note attached said “Feast your eyes, C.L. !” and feast I did. There were many lovely, imaginative gardens pictured. As I looked though the magazine I realized that one of the reasons that the gardens were so appealing was that they were planted so lushly. They were mature gardens. I have a new garden at Poison Ivy Acres. There is no way I can make it look instantly mature…mature is, by definition, fully developed. It isn’t good to cram the shrubs and trees so tightly that in five years they are too crowded. I don’t want to fill space inappropriately. An established landscape can’t be created instantly; I have to fake it. 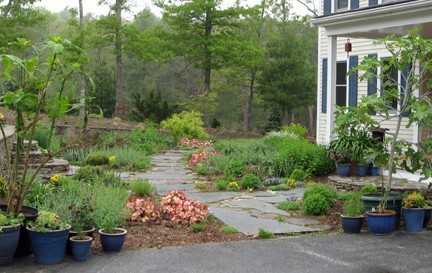 There are ways to fill gardens fittingly. 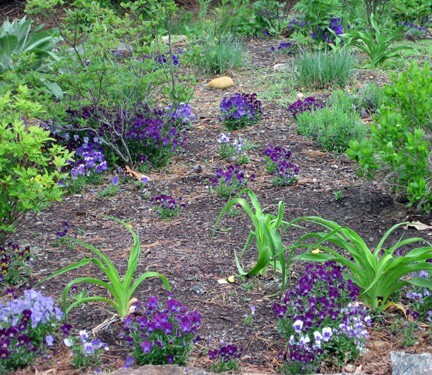 Groundcover perennials such as Geranium macrorrhizum and Hosta can be planted around smaller shrubs and trees. These will fill in while the larger plants grow, and eventually those shrubs and trees will dominate. I will also make good use of the queens of instant landscapes: annuals. I plan to plant a large number of sunflowers. Alyssum seeds have been sprinkled in several locations, and Cleome, Cosmos and tall Nicotiana will definitely play a role. Nasturtiums? Come on down…or up, that is. Violas: I love you! I’ve planted many biennials from seed because these too will fill areas that really belong to future perennials and shrubs. Verbascum olympicum, Verbascum chaixii ‘Sixteen Candles’ and Verbascum hybrida ‘Banana Custard’ fill the floor of my shed, along with two varieties of foxgloves. I haven’t met a Verbascum I that I don’t love. A garden is only one of the many ways in which we are taught patience in life. The plants I am sneaking into my yet-to-be-mature landscape remind me that just because I need to be patient doesn’t mean that I’m powerless. Do you love foxglove? Grow them from seed. 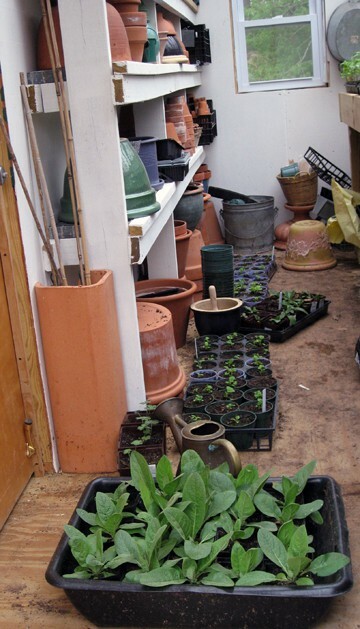 Transplant the young ones into pots, as I've done here, and then place them in the garden in late June. Be warned and be thrilled: every seed germinates! The front garden is a coral/blue/white/yellow garden - helped this year by some nasturtiums, and lovely Allysum, Nierembergia, and Diascia from Proven Winners.